Worldwide, emission from all sources caused an estimated 33.70 lakh deaths, out of which 3.85 lakh were attributable to transportation. Air pollution from transportation sources caused an estimated 74,000 deaths in India in 2015, out of which two-thirds (66%) could be attributed to tailpipe emissions from diesel vehicles on the road, according to estimates in a global report by researchers from the International Council on Clean Transportation (ICCT), George Washington University, and University of Colorado Boulder. These 74,000 deaths, in turn, were among 8 lakh deaths caused by ambient PM2.5 and ozone from all emission sources. Worldwide, emission from all sources caused an estimated 33.70 lakh deaths, out of which 3.85 lakh were attributable to transportation. Out of the transportation-attributable deaths, diesel vehicles on the road contributed an estimated 47% worldwide. The study links vehicle emissions, air pollution, and epidemiological models to estimate health impacts at the global, regional, national, and local levels in 2010 and 2015. 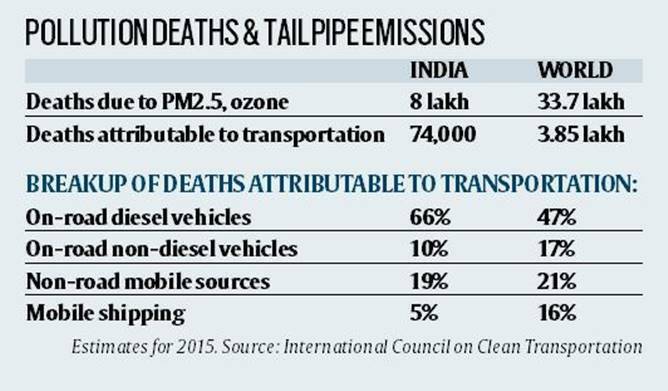 In 2010, transportation emissions caused 3.61 lakh premature deaths, before it rose to 3.85 lakh in 2015. The study found that 70% of these deaths occurred in the four largest vehicle markets — China, India, the EU and the US — but the trends were different. From 2010 to 2015, transportation-attributable deaths declined by 14% in the EU and by 16% in the US but increased by 26% in China and India. The reductions in the EU and the US are attributable to the implementation of world-class standards for fuel quality and new-vehicle emissions, the report stated, and added that the increases in India and China indicate that growth in transportation activity exceeded the reductions from emission control policies from 2010 to 2015.